Over the years, the platform bed has developed into a sleek popular option. Anyone who is looking for a simple upgrade or design change to their room may want to consider starting with swapping their old bed for a new platform bed. Every platform bed has a flat or closely slatted wood platform used for support. The main idea is to provide enough stability and support so no box spring or other foundations are needed. Typically, a platform bed is low to the ground which makes it extremely sturdy. This sturdy support is ideal for foam mattresses, however, it can also be used with a hybrid or innerspring. A platform bed has a few advantages over a traditional box spring and mattress combo. Firstly, it offers better support and stability. This stability makes the bed a great option for heavier users. Secondly, not needing a box spring or foundation saves money which makes a platform bed more cost-effective. A third benefit is storage capacity. Most platform beds are available with drawers on one or both sides, giving extra space for storage use. Tuft & Needle have made a great name for themselves in the mattress industry. Earning thousands of reviews and a place on Amazon’s top choices. When you’re comfortable, you sleep; it’s that simple. With a motto like this, Tuft & Needle have made their goal very clear. To offer the most comfortable, best quality mattress for their customers. On top of that, they have also challenged themselves by making it affordable for everyone. The company also believes in quality over quantity. We see this in their 2 layered 10-inch foam mattress. The top layer is 3 inches of their own specially designed foam. This 3- inch layer of proprietary adaptive foam was created to be extremely soft but still offer effective pressure relief for the user. The softness combined with the firm underlying 7 inches of core support foam allows for just the right amount of pressure relief and contour. 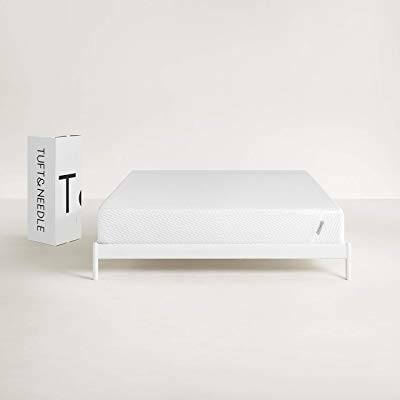 Although the Tuft & Needle may have a different feel for a side, stomach, and back sleeper the mattress is more than suitable for all sleeping positions. Some important information regarding temperature regulation can be found in their proprietary adaptive foam. It has been engineered with both graphite and cooling gel to help regulate temperature. This is important considering memory foam mattresses have become infamous for sleeping hot. Tuft & Needle made sure to check all the boxes when it came to certification. Like many of its competitors, the foam used in the Tuft & Needle is CertiPUR-US certified. In addition, the mattress is also GREENGAURD Gold certified, Parent Tested Parent Approved, and holds STANDARD 100 by OEKO-TEX certification. So, you can be sure the mattress is good for you and the environment. Every Tuft & Needle mattress is produced in the USA with a 100-night no-risk sleep trial and a 10-year warranty. 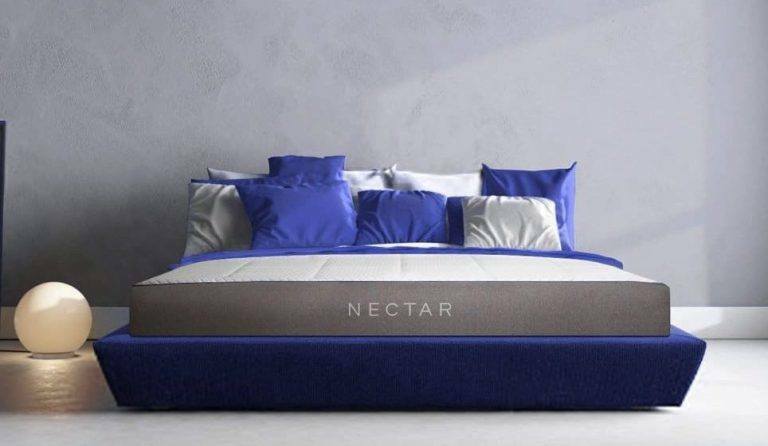 Apart from their mattresses, Nectar has two great things working in its favor. Firstly, they have a 365-night sleep trial which beats most competitors by at least 250 nights. Having one whole year to test a mattress is a nice luxury most companies aren’t willing to supply. Secondly, Nectar sells every mattress with a Forever Warranty. Just like the sleep trial, this warranty is much better than the market average 10-year warranty. Any company who is willing to offer a one year trial and a lifetime warranty must be confident in every aspect of their product, which is one reason we like the Nectar. 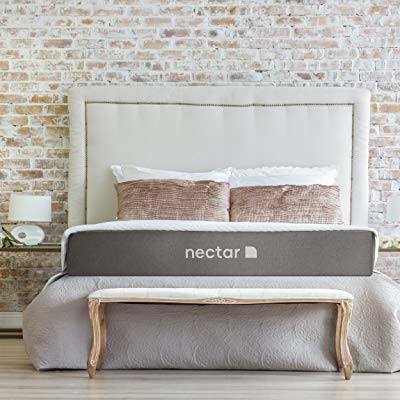 Now, about the mattress, Nectar offers an 11” mattress that’s constructed of 3 different foam layers, plus a Tencel cover that is quilted together with a 1” layer of gel memory foam. The Nectar contours very well using 1-inch of cooling gel and 3 inches of adaptive core memory foam. Adding to the contouring might, Nectar also utilizes the extra inch of gel memory foam quilted into the bottom of the cover. Unlike a traditional memory foam mattress that leaves the user feeling sunk and stuck, the buoyancy of the gel foam helps prevent that typical stuck feeling. This characteristic actually helps the mattress to breath better, keeping the user cooler through the night. Working together with the top comfort and transition layers is the main support layer. A 6-inch thick foam layer of high-density core support foam. This foundational layer helps to keep the user in a healthy position throughout the night. The Nectar mattress is CertiPUR-US certified, meaning its safe for you and the environment. It is also dust mite protected, ensuring you never have to worry about allergies caused by the pesky dust mite. With over 25,000 total reviews on Amazon, the Zinus is not only top rated by the masses, but also top rated by Amazon. Zinus found a way to create a top quality mattress and make it available at an extremely reasonable price. The Zinus is made from 5 pressure relieving memory foam layers that support the user in all the important areas of the body. What makes the Zinus ideal is its combination of an extra thick memory foam comfort zone that contours perfectly to the body and an extra supportive high-density base foam which prevents the user from sinking into an unhealthy position. With Green Tea in its title, it’s no surprise the Zinus is infused with a green tea extract. This extract infusion acts as a safe anti-oxidant that keeps the mattress fresh and smelling good. The only negative we could find about the Zinus is its chance for overheating. With all the top layers completely focused on pressure relief, contour, and support, the mattresses only airflow comes from the third layer of foam which has egg carton design. So, if overheating is a common problem you struggle with, one of the other mattresses on our list may be better suited for you. The Green Tea mattress is produced in China and comes with a 10-year warranty. Although the mattress is extremely popular on Amazon, through their own site the company offers a 100-night sleep trial. Furthermore, they stay environmentally and user-friendly, with every mattress being CertiPUR-US certified. Taking the prize for the thickest mattress on our list is the whopping 14-inch Classic Brand Cool Gel. Made completely out of foam, this mattress is comprised of four layers designed for perfect comfort and support. Up top, there is a 2-inch layer of open-celled Cool Gel memory foam that keeps the mattress breathable and ventilated. Working together with the top comfort layer is a second layer of regular 2-inch memory foam. These layers work together to bring the ultimate level of contour and response. Next, there is a third layer of 2-inch soft comfort foam adding even more contour and pressure relieving support. Carrying everything is a final layer of 8-inch high-density support foam. One great highlight of the Classic Brand Cool Gel is its ability to keep up with your movements. 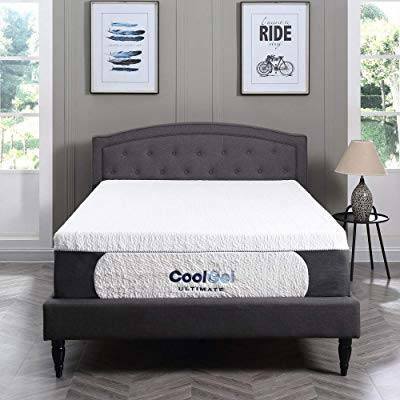 Cool gel memory foam has faster responsiveness than traditional memory foams meaning when you change your position, the mattress is there to support you. Mattresses like this also have been shown to offer the best motion isolation. Almost all motion will be absorbed by the 6 inches of comforting foam before it can reach the base and cause a disturbance. The foam used in the Cool Gel mattress is CertiPUR-US certified meaning it’s safe for the use and the environment. Memory foam is also hypoallergenic which keeps the mattress free from mold, bacteria, allergins, and dust mites. The Classic Brands Cool Gel mattress is produced in China and is sold with a 10-year warranty. 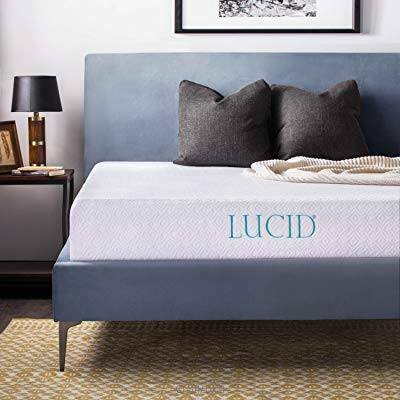 The Lucid plush gel memory foam mattress is ideal for a platform bed. Although Lucid offers a wide range of firmness and construction options, we recommend their 10” plush memory foam. Lucid’s 10” construction is made up of two simple parts. A 3” layer of gel memory foam and a 7” layer of high-density support foam. A firm mattress on a firm platform bed may be too stiff for comfort. With 3 inches of contouring gel foam, it doesn’t matter whether you’re a side, stomach, or back sleeper, the Lucid will offer a great balance of cushion and support. 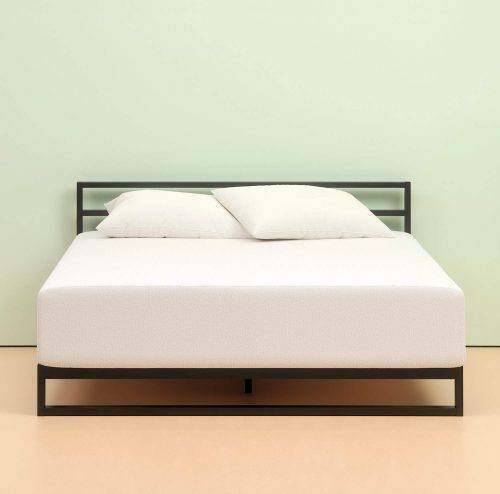 The foundation of the Lucid is 7 inches of high-density support foam which gives the mattress its stability and finishes off the bed’s shape. Having only two layers, most of the Lucid’s highlights lays within the top comfort layer. The 3” gel infused memory foam is engineered to relieve pressure points and keep you cool. Microscopic gel particles absorb heat and move it away from the body to help prevent overheating as you sleep. To help with airflow, the foam used in the Lucid is open cell and ventilated. This is important because a cooler sleep normally leads a more comfortable sleep. Adding even more cooling protection, the Lucid is wrapped in a premium Tencel cover. Tencel provides two things, increased breathability and natural moisture control. Both of which ensure a night of better sleep. The Lucid is made in China and comes with a 10-year warranty. 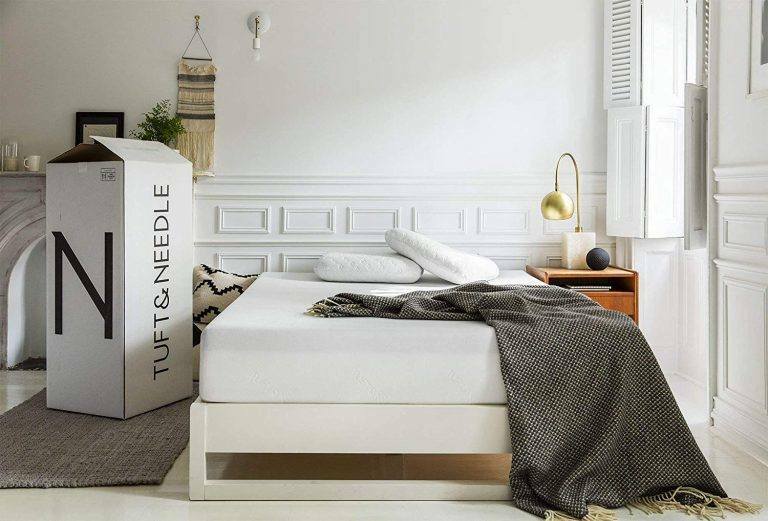 Tuft & Needle is a great company that produces a great mattress. We like their mission to offer a high-quality mattress at an honest price, no one likes to be ripped off or taken advantage of. Below are a few of the deciding factors which helped us choose. 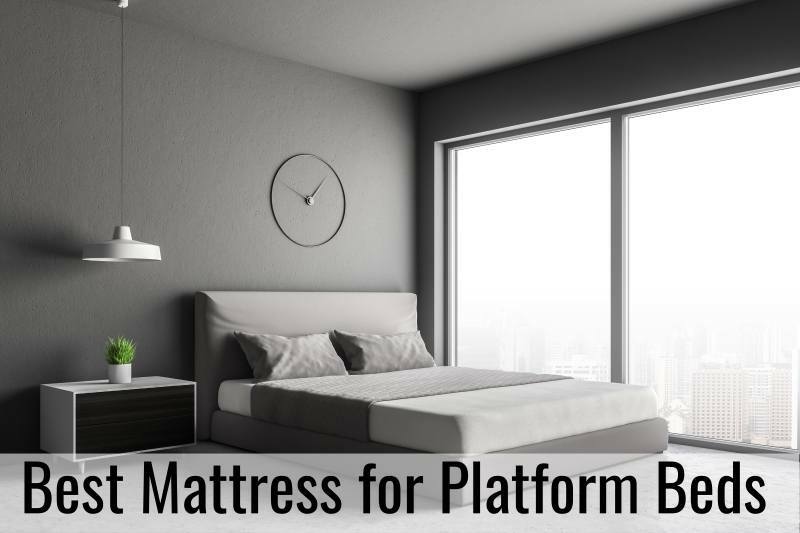 Platform beds are a great way to update a room to a more sleek and modern look. They can be made from almost any material, fabric, wood, plastic, or metal. With the popularity of foam mattresses increasing, we also see an increase in popularity of platform beds. Foam mattresses are ideal for the stable construction of a platform bed. So much so that it’s almost as if they were made for each other. We hope our top 5 choices help you find the mattress that’s best for YOU!